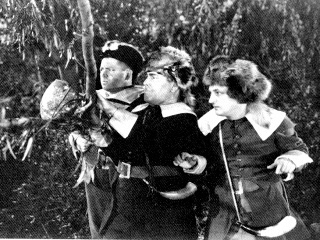 Set in colonial times, the Three Stooges (Moe Howard, Larry Fine and Curly Howard) are sentenced (by prosecutor Bud Jamison) to defend the English colonies (instead of 50 years hard labor) and quickly fall for the Governor’s (Vernon Dent) three pretty daughters (Faith, Hope and Charity) after a funny dancing scene with the daughters – and go hunting for turkeys against the orders of Chief Rain in the Puss, leader of the local tribe of American Indians – who will not allow the Pilgrims to go hunting until they pay 5,000 shekels. The Three Stooges exchange their pilgrim hats for coonskin caps — except for Curly, who puts on a skunk cap. Curly accidentally discharges his gun, shooting a large turkey (which lands on Larry, knocking him down). They fire upon a group of “turkeys” — which turn out to be Indians wearing headdresses, leading to the second half of the short film, where the Indians chase the Three Stooges, and the Stooges try to stay alive. There’s a very funny segment where Moe and Curly “lose” Larry, and have to rescue him from being burnt at the stake — and from a woodpecker as well! This leads to one of the Stooges best slapstick fights, and the Three Stooges escaping via boat — in motorboat style. Back to the Woods is available as part of The Three Stooges Collection volume 2 (DVD). Larry: [an imaginary horse race] They’re off! Who’s in the quarter? Larry: Who’s in the half? Larry: Who’s in the stretch? Judge: [shouting above the confused noise] Order! Order! Curly: Order? I’ll take a ham sandwich! Larry: [as Curly heads for Faith, who is more attractive than her sister Charity] What doest thou? I saw her first! Curly: Pish-posh and tish-tosh! I’ll never give her up. Why does not thou take Charity? Larry: I need not charity. I’m on the WPA. Larry: Aye! Willing Pilgrims Association. Chief Rain in the Puss: Ugh! No more war. Give 5000 shekels. Governor: But we have no more than this. Chief Rain in the Puss: Mmmm! Good down payment. Take mortgage on balance – interest six per cent. Pilgrim: Thank goodness! At last are we free to hunt? Chief Rain in the Puss: No! No hunt till FOB! Chief Rain in the Puss: Fork over balance! Curly: Which one is Will?